Type 1 diabetes, commonly referred to as juvenile diabetes, is typically diagnosed in children or young adults, though diagnosis can occur in any stage of life. Of the nearly 26 million people in the United States with diabetes, only 5% have type 1 diabetes. The condition is chronic; patients live with the disease for life. With treatment and dietary changes, patients can live a healthy, productive life. Type 1 diabetes starts with the pancreas. The pancreas is responsible for the production of beta cells that produce insulin. These beta cells produce little to no insulin in patients with type 1 diabetes. 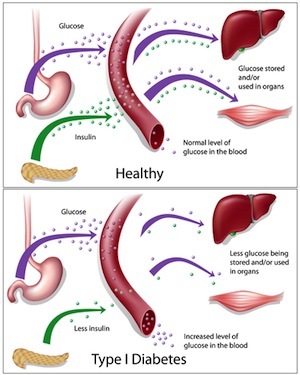 Without sufficient amounts of insulin, glucose collects in the blood instead of being processed and moved to cells for energy. Elevated blood glucose and lack of glucose energy is the primary cause of type 1 diabetes symptoms. Symptoms of type 1 diabetes can start very early in life, depending on the severity of the disease. If beta cells are not producing any insulin, the build-up of glucose can occur in infancy, but symptoms can be missed, especially since babies sleep the majority of the time and cry for nurturing, feeding and other needs. If symptoms are not recognized diabetic ketoacidosis (DKA) can develop. DKA is a life-threatening condition. Type 1 diabetes can be diagnosed with an elevated blood glucose level and a fasting blood glucose test. The patient stops eating or drinking at least eight hours before the test. Blood is drawn and the blood glucose level tested. Glucose levels in excess of 126 mg/dL could be a sign of diabetes. Doctors typically require two positive tests before delivering a diagnosis of diabetes. Another test is the oral glucose tolerance test. Patients follow the same pre-test protocol of no food or drink for eight hours prior to the test. An initial blood draw is performed before the patient is asked to drink a glucose solution. Blood draws are performed at 30 to 60 minute intervals after drinking the solution. If after two hours blood glucose levels are still measuring above 200 mg/dL the patient is diagnosed with diabetes. After the initial diagnosis is made, patients may have to spend several days in the hospital for education and monitoring. During the hospital stay, doctors, nurses, and educators work with the patient and the patient’s parents, if applicable, to teach proper diabetes control. Type 1 diabetes is an insulin-dependent form of diabetes, so patients are prescribed insulin injections. Young children and patients having difficulty controlling insulin/blood glucose levels may be prescribed an insulin pump that delivers a constant supply of insulin. The amount of insulin delivered can be adjusted on the device or with a remote control. Patients may have to alter food intake, maintain a food journal, record insulin injections and blood glucose readings until the disease is under control.